Remembering a December Blue Grouse Hunt with Farles. 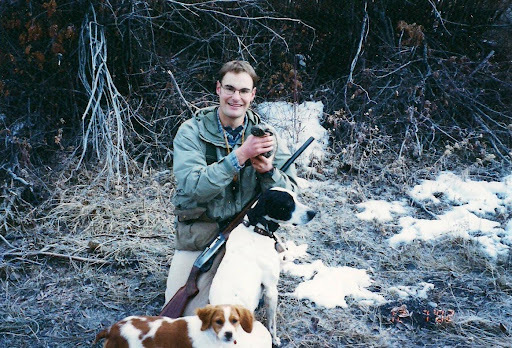 Farley’s last blue grouse hunt. Bird hunting in December is vastly different from the summer-like days of September, the colorful autumn days of October, or even the crisp, shorter days of November. There is a confidence and ease that one feels in the uplands while following a dog and toting a shotgun during these kindlier months when the birds are more abundant and naive. It’s hard to describe, but you feel like the sky is the limit and that you will get plenty of opportunities to be afield with the dog and make good on your shot. In December, however, with the bone-chilling cold and the accumulating snow, I feel a sense of urgency or desparation while bird hunting–a realization that I cannot pass this way again until next fall. I don’t know about you, but for me, shooting is mostly mental. When I feel confident, I generally shoot well. If I am having a bad day or a bad week, this sometimes negatively affects my shooting. After eleven years of bird hunting, I admit that I generally do not shoot well in December. Too many times to count, I have missed easy shots in this frigid month. But that is not always the case. This morning when I awoke, I naturally reflected on a blue grouse hunt that took place almost seven years ago today, Saturday, December 7, 2002. At the time, my family and I lived in Picabo, Idaho near the famous Silver Creek. The area was experiencing a drought and, even in the surrounding mountains, the scant snow had not cut off access. This was the end of little Sunny’s first season and, by this time, Farles was a seasoned veteran–a once in a lifetime bona fide bird dog. That morning, a good friend, Tom John, and I decided to chase blue grouse not too far from the Hailey area. For those of you who do not know, blue grouse are the only grouse species that reverse migrate, which means that as winter sets in and the snows deepen, they actually migrate to higher elevations as opposed to lower elevations like other grouse. Thus, because of the snow pack, you cannot always get to where the blue grouse are in December–the tops of the mountains. The year 2002 was a welcome exception to this rule. To get to our destination, we had to drive through a narrow steep canyon. The ground was covered with only a few inches of snow, but with Monty, my Mitsubishi Montero Sport, the roads were easily manageable. I’ll never forget, however, driving across the little ice-covered creek and suddenly dropping one foot into its depths when the ice gave way. For a moment I thought we might get stuck, but Monty charged through safely. The mountains around Hailey and Bellevue, Idaho are generally very steep, but one will quickly notice an absence of timber. While living in the area, I learned this is because the miners cut down all the timber in the 1800’s to smelt their precious metals. Galena, a natural mixture of lead and silver was the prominent find in this area. It is amazing how long it sometimes takes mother nature to recover from this type of abuse by mankind. Fortunately, the northfacing slopes in this area have begun to recover and the forest is returning, which creates the habitat needed by blue grouse. Tom, Sunny, Farley, and I embarked up one such steep slope. All I will say about the difficulty of the terrain and slickness is that chukar hunters have nothing on late season blue grouse hunters. As we hiked upward, we came across an old abandoned mine shaft–evidence of the aforementioned history. As we followed some grouse tracks towards a lofty pine tree, a grouse caught us off guard by ripping out of its roost downhill in a noisy flush. This is tough shot even when you know the bird is there, but somehow I recovered and instinctually threw up a shot which caught the grouse at about thirty yards. With the steep slope, the limp bird fell almost double the distance from where it was hit. “Good shot!” Tom complimented. To be honest, I was surprised I had made it myself. This seemed like a pretty good way to end the Idaho grouse hunting season. 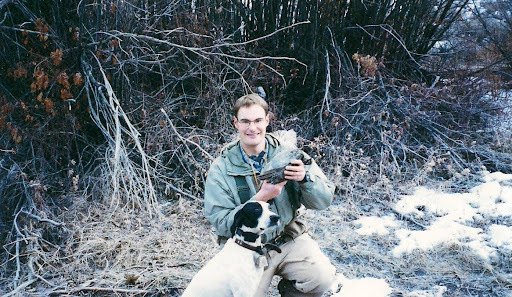 I did not know at the time that this would be Farle’s last blue grouse hunt. The memory has a bitter sweet feel for me–like a ghost of December past. Ghosts of December Past and Future: Farley, Sunny and I on one of our last hunts together. Tiny Sunny, who was along for the hike, definitely had big shoes to fill. While she can never accomplish all that Farles could because of her breeding and physical limitations, she has given me something entirely different, but every bit as special. She has been my trusted companion and friend for seven years now and we have shared many unforgetable days afield together. What she lacks in natural ability, she makes up for in heart. I wouldn’t trade my time with her for anything. As Solomon stated in Eccesiastes, “For to him that is joined to all the living there is hope: for a living dog is better than a dead lion.” (Eccl. 9:4). Here’s to the hope of future Decembers with Sunny girl. Little Sunny and Farles. Sunny had big shoes to fill, but she has held her own and won the heart of this hunter. Next Post >We’re Off to See the Wizard! Aw, now you're making an old man cry Andy. That last picture of Sunny and Farley is just wonderful! I know how much you miss your dogs. I have a longer list–Skip I, Toby, Tuck, Tim, Tag, Skip II, Babe–all resting in an eternal place. 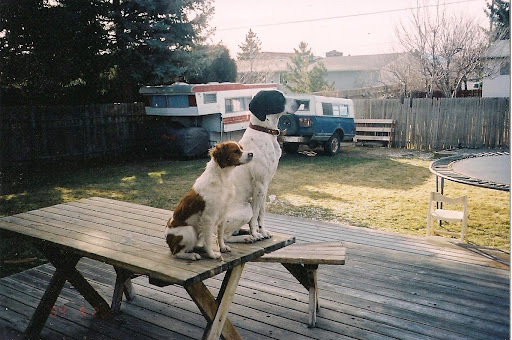 People who have never had a hunting dog and all the memories of them at home and afield have missed a part of life that the Creator gave us as a special gift. The look in their eyes when they want so hard to please us is wonderful! I think I'll go give Pride a pat on the head and a hug. Keep those precious memories alive Andy. They fade fast if you let them.